Field measurement of agricultural greenhouse gas (GHG) sources and sinks in developing countries is fraught with difficulties, as landscapes are often parcelled into tiny plots with a vast array of different land uses. To deal with this, researchers must take into account the need for low-cost measurement methods that can be easily deployed and used in the field. 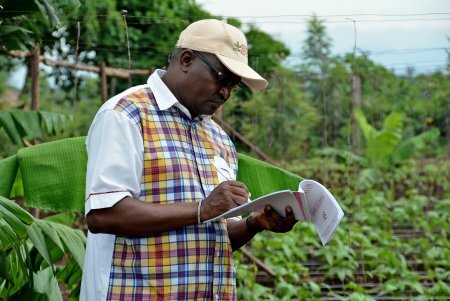 The newly available Standard Assessment of Agricultural Mitigation Potential and Livelihoods (SAMPLES) measurement guidelines and database offer means to deal with these challenges. SAMPLES, created by CCAFS and a range of partners led by the Gund Institute for Ecological Economics, University of Vermont, enables compilers of GHG inventories, developers of mitigation projects, researchers and students in developing countries to better quantify emissions and mitigation potential. This, in turn, helps farming communities take action to reduce their GHG emissions and mitigate agriculture’s contribution to climate change. 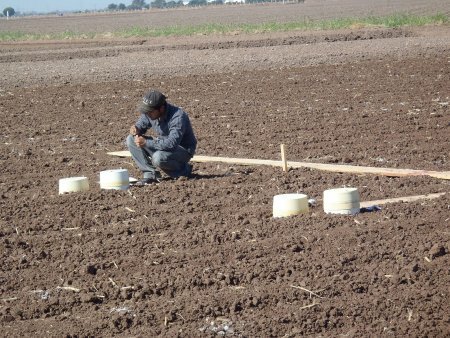 Several innovative approaches in SAMPLES help users reduce the costs of collecting agricultural GHG data. For example, a major difficulty in measuring emissions from soils (such as nitrous oxide given off when fertilizer is applied) is that it involves processing many gas samples. The SAMPLES guidelines describe a new approach, validated by CCAFS researchers, that allows gas samples to be pooled prior to processing, greatly reducing the costs involved. The SAMPLES guidelines also describe all the potential methods that may be used for a particular GHG source or sink, and compare these in terms of cost, complexity and suitability for different situations. There are, for example, many different ways of measuring methane emitted by ruminant livestock. Respiration chambers are the ‘gold standard’, but are expensive and not suited to grazing animals, so the guidelines also describe cheaper alternatives. Equally important, the SAMPLES platform contains a new database where compilers of GHG inventories, and those developing mitigation actions can find out about country-specific emission factors entered by CCAFS researchers. Other scientists can also upload their own data. There is clearly great demand for this guidance – since the SAMPLES platform launched in June 2015, it has had nearly 10 000 page views and over 1 000 downloads of the guidelines.